Without a doubt most of Bay Area residents think that San Francisco Bay Area real estate is most expensive in the whole world. Let's take a look around the globe. 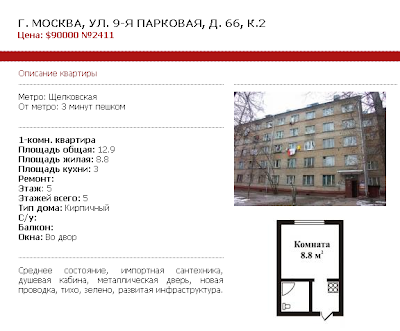 My Russian coworker kindly translated for me this advertisement for 12.9 square meters (138 square feet) condo for sale in Moscow, Russia. The seller asked just $90.000 dollars!!! My coworker has no idea why the condo is so expensive. The future owner can reach nearest metro station in three minutes on foot and then Kremlin and Red Square in just 20-25 minutes by metro, but still the kitchen combined with restroom and shower. Perhaps the entrance steel door costs half of this tiny real estate property. Update from the same source - the bottle of Veuve Clicquot Ponsardin Champagne costs in Moscow around $90 comparing with $36 in the local Safeway. Thanx for sharing it with us.. I work at a Real Estate investment company and we have been working with a lot of Russian buyers looking for property in South Florida.